Keeping Your Child’s Teeth Healthy Before Any Big Problems Arise! Instilling the right oral hygiene habits in your child from an early age (along with routine dental visits) can set them up for a lifetime of healthy, happy smiles. After all, we’ve all heard of “preventative maintenance” when it comes to our cars, right? You change the oil every few thousand miles so the engine continues to run smoothly, avoiding serious problems down the road. Preventative dentistry is much the same. At Children’s Dental Zone, we are huge proponents of a preventative maintenance approach to dentistry, as it keeps your kids healthy and is a lot easier on your wallet! According to the American Academy of Pediatric Dentistry, your child should have their first dental appointment around their 1st birthday and continue with routine exams every six months (unless a pediatric dentist suggests more frequent appointments). While it’s important that you keep your child current with dental appointments, it is equally important that you practice an effective oral hygiene routine at home so that your child will develop healthy dental care habits as they get older. For infants, use a soft, wet cloth to wipe the gums and only put them to bed with water in his or her bottle. As soon as teeth erupt and until the age of 2, use a soft bristle toothbrush with a small smear of toothpaste. Begin flossing when your child has 2 adjacent teeth, as flossing removes plaque from in between the teeth and under the gum line where a normal toothbrush cannot reach. For older children, brush the teeth at least twice daily and floss once daily until your child is old enough to do it on their own. You’ll want to continue monitoring your child’s dental care habits until at least the age of 8. 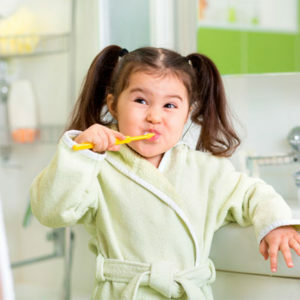 Many times children “brush” their teeth, but they aren’t doing it correctly or effectively before this age. Diet is often overlooked when it comes to preventing cavities, but it is just as important as oral hygiene. When it comes to preventing cavities, limit the amount of sugar that your child eats, as well as the amount of time the sugar stays in his/her mouth/teeth prior to brushing. This probably goes without saying, but make sure your child eats a steady diet of vegetables, yogurt, cheese, and other healthy alternatives. Doing so will assist in keeping their teeth and gums healthy. It can be a challenge to keep your child’s posterior teeth (the teeth towards the back of the mouth) completely free from food and bacteria, which is why dental sealants are often recommended. A dental sealant is a protective coating applied on the chewing surfaces of your child’s molars to prevent food and bacteria from becoming stuck within the tooth’s nooks and crannies. Made of the finest dental plastic, sealants help prevent tooth decay for children between the ages of 6 and 14. Get Your Kid “Addicted” to Xylitol Instead of Sugar! Xylitol is a natural sweetener commonly used in gum, mints, and other candy. It tastes like sugar, but it does not stick to the teeth or cause a breakdown of tooth enamel. Therefore, choosing xylitol-sweetened candies can reduce the acids in your child’s mouth by up to 90%, which helps prevent the development of plaque and reduce the risk of cavities. Preventative Dentistry is Important! Book Your Child’s Appointment Today! If you are in or around the Johns Creek area, we encourage you to give our practice a call and schedule your child’s appointment. 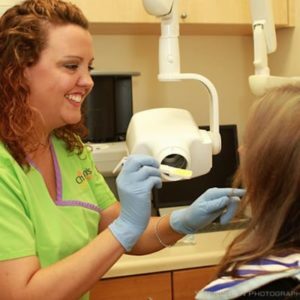 At Children’s Dental Zone, we are committed to preventative care. 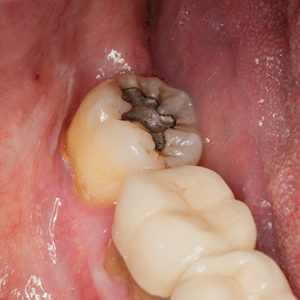 We want to treat minor dental problems before they become major (and costly) issues. Give us a call today!